Before the real meat of this post, a quick update on the bees. 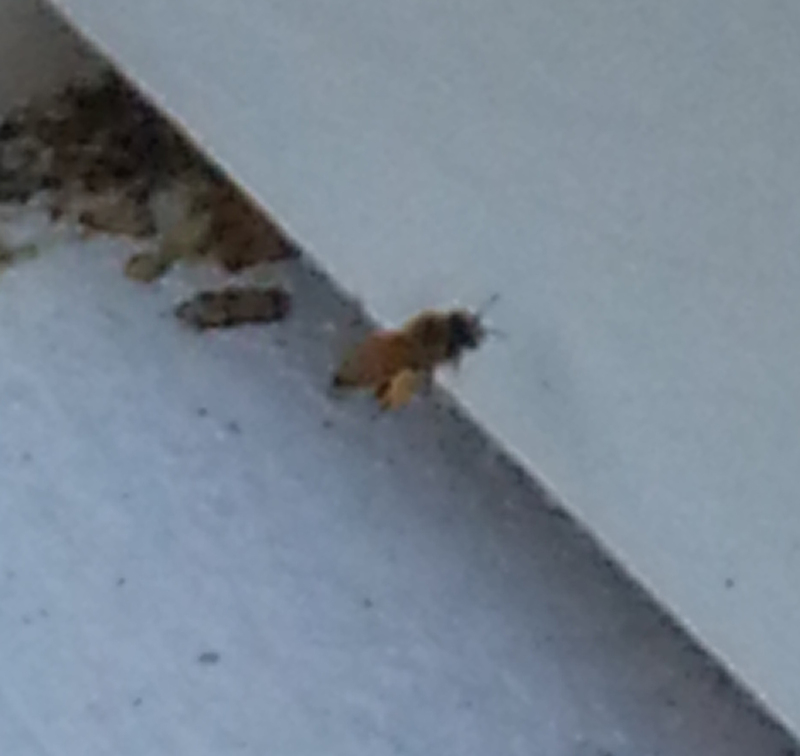 As of last week, I can report that they are schlepping pollen to their hive. I expect to find baby bees when we open it later this week. Meanwhile, here are a couple of close-ups of my girls with full pollen baskets. 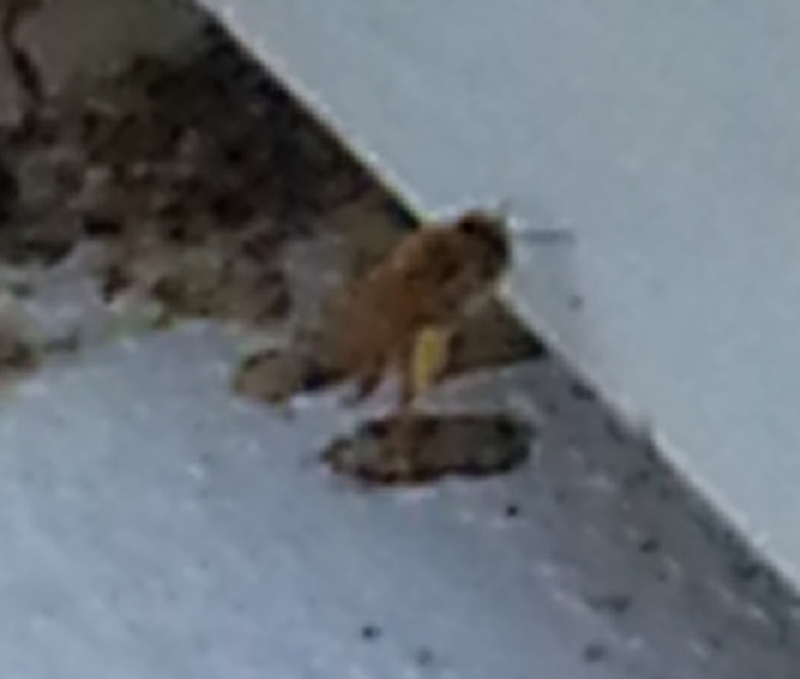 The brighter yellow ball hanging underneath the bee is pollen. Another shot of a bee with a full pollen basket. One of the most amazing things about having a job is paid vacation. This past year, I jealously hoarded the week and change I had left after my daughter’s wedding in order to begin addressing The Landfill I Call Home. When we moved to this house six years ago, I was in grad school and working full time. I made a conscious decision to put unpacking and housekeeping last, focusing my energy on doing a good job for the People (I’m a public sector employee) and excelling at my studies (I graduated with honors). During that period, I moved my mother across six states into an assisted living apartment and then to a single room in a nursing home. Which did nothing – and continues to do nothing – to help decrease the stuff in my house or increase the amount of time needed to deal with it. Bottom line: Last year, I got my masters degree. I did a bit here and there, but the cleaning/organizing/purging process does not come any more naturally to me than it does to Sweetheart. Nonetheless, this week, it’s happening. My dream would be to Marie Kondo the entire place wholemeal. But one thing I have worked hard to be good at is seeing things as they are. Trying to take on the entire house in a single week is a recipe for defeat. I started the study a couple of months ago, when I had a long afternoon. It went from okay to terrible in about three hours. I was so traumatized that I stopped. The Ultimate Before Picture. 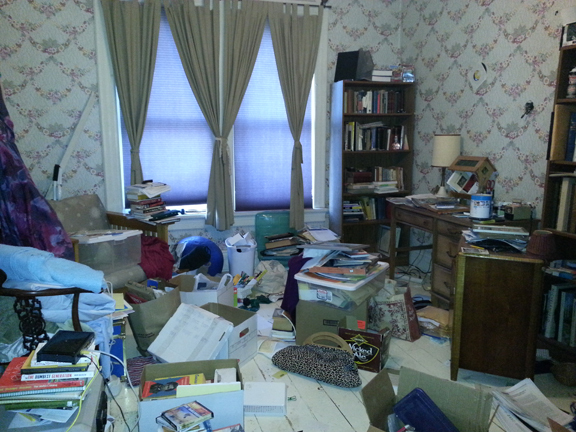 I am mortified to be posting this, but if all goes well, the next picture of this room will look way different! I’ll probably be posting every other day or so this week, maybe even daily as this process unfolds.